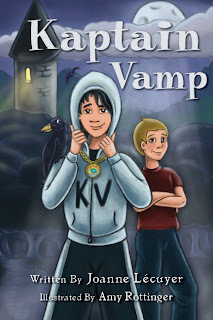 Today at Reviews and Interviews is children's author Joanne Lécuyer to talk about her writing and her newest book, Kaptain Vamp. Children’s book author, Joanne Lécuyer, has a Bachelor of Arts in Communications and Visual Arts from the University of Ottawa and a Diploma in Public Administration from the University of Quebec. She is also a Professional and Personal Coach and Reiki Master. Joanne has worked for the Canadian federal government for over 25 years, with the last 15 years in strategic and organizational communications to help management and employees communicate better. Joanne was born in Timmins, Ontario, Canada but spent most of her life in North Bay, Ontario. She lives in a small rural community near Ottawa, Ontario, Canada with her husband Rick, their dog Kato and their two cats, Black Magic and Minx. Welcome, Joanne. Please tell us about your current release. Kaptain Vamp is my second children’s book. The story is about a young vampire named Allistaire, who is also part human, who wants to change the fact that humans are afraid and distrustful of vampires. His family has been living among humans for hundreds of years and they’ve always used their abilities for good. One day, while reading his favourite superhero comic, Allistaire decides that he’s going to do everything he can to help humans. He enlists the aid of his best friend Rich to help him become Kaptain Vamp. Since vampires have been the rage for adults for the last few years, I thought it would be fun to write a story about them for kids. I liked the challenge of taking this theme and making it positive. I didn’t want to give the kids nightmares. Also, I thought a vampire-human superhero would make a good story. I’m working on a few stories, but I think the next one will be about a fairy. I’ve also got outlines for sequels to my first book The Witch, the Cat and the Egg and Kaptain Vamp for 2012. I’m also experimenting with other writing mediums. I’ll soon have one or two new comic strips that will be available only on the website. Readers will be able to vote for the one they prefer and I’ll either continue with as a comic or turn the story into a future book. Before I published my first book The Witch, the Cat and the Egg in 2010, I didn’t really consider myself a writer even though I do a lot of writing in my full-time job. Now with my second book, and others in the works, I’m starting to call myself a writer. Whether I can call myself a good writer is up to my readers. I have a full time job with the Canadian federal government, which keeps me pretty busy during the day and week. So, I usually work on my books and the website, during the evenings and weekends. I also get some of my ideas in the early morning, during my bus commute to work. I’m not sure if it’s a writing quirk, but I like to read the stories to my husband, at various stages of development. He’s a great sounding board. When I have a good draft, I also give it to some test readers – friends and familly. For me it’s important to get feedback. It helps me to know if I’m on the right track and when I need to make some changes. I don’t remember wanting to do anything specific. However, when I was a child, I’m told that I was always walking around with a pencil and paper in my hands. As a teenager, I really liked to reproduce and draw images from various books and posters, especially fantasy. When I started writing stories for children, I decided that I would write the kinds of books that leave my readers feeling good and wanting more; that also leave them with a smile on their faces. The type of book that you can read kids before they go to bed that will help them have good dreams! That’s what Topsy Books is all about. My personal motto is “Dare to imagine and believe in the magic of possibilities!” I hope that new readers will make Topsy Books part of their reading collection. Readers can connect with me through my website (www.topsybooks.com), Facebook (Topsy Books), and on Twitter (@JoTopsyBooks). Thanks for being here today, Joanne. I hope the muse keeps inspiring you.